The latest technology advances take diode-pumped solid-state lasers into new realms of power and wavelength, enabling many new applications. Neodymium-doped crystals and glasses such as Nd:YAG (neodymium:yttrium aluminum garnet) have long been used as laser gain materials. Optically pumped, they produce an output wavelength close to 1 µm, and the excited-state lifetime of neodymium allows both CW and pulsed (Q-switched) operation. The output of powerful flashlamps and arc lamps is focused into a cylindrical laser crystal rod using elliptical reflectors to form a gain module. 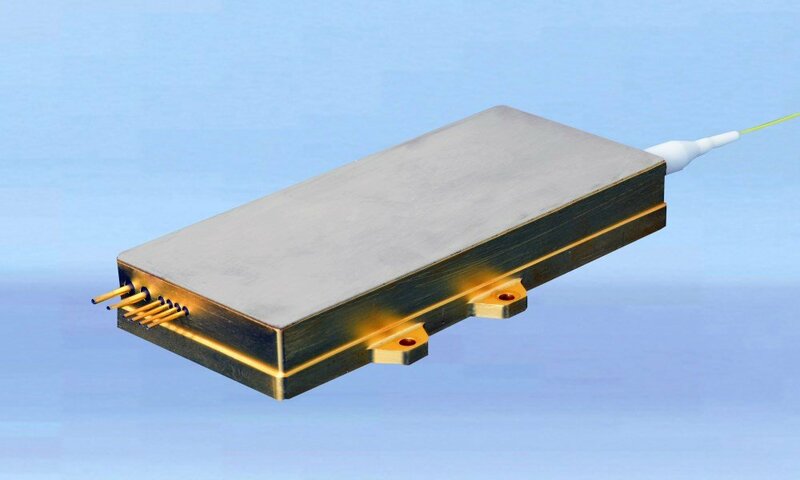 This module is then mounted in a laser cavity, typically many inches in length and defined by the usual high reflector and partial reflector, or output coupler. There are several limitations to this approach. First, pumping is inefficient, partly because lamps are inefficient at converting electricity into pump light and produce a lot of unwanted heat. But even more critical, the lamps produce broadband emission throughout the visible and the infrared. As a result, most of the light is not absorbed by the laser gain crystal and ultimately serves only to generate more heat in the pump module, which must be removed by water cooling of the laser head. The lamps also require a multikilowatt power supply. For many industrial applications, the biggest drawback is the short lifetime of CW arc lamps, which must be changed every 200 to 600 hours. When the lamps are replaced, the cavity optics usually require a slight realignment to maintain a good output mode from the laser. This frequent routine maintenance actually conceals another limitation — their optical alignment tends to drift over time and would require periodic realignment, irrespective of any lamp change. Diode pumping eliminates these limitations and drawbacks. The principles of diode pumping are simple. The Nd-doped laser crystal has intense, sharp absorption peaks at 808 and 880 nm — wavelengths that are readily accessible to InGaAs semiconductor laser diodes (Figure 1). Laser diodes convert much of their electrical input into laser light, which is then efficiently absorbed by the Nd-doped crystal. The end result is a wall-plug efficiency many times greater than lamp-pumped lasers. Figure 1. A flashlamp emits over a wide spectral range (b), but laser crystals such as Nd:YAG absorb light only in narrow wavelength bands (a). Diode laser pumping is efficient because the diode laser emits in only one of these bands (b). There are several other major advantages to this approach beyond electrical efficiency. Depending on the output power, these lasers generate relatively little heat and therefore may not require a high volume of cooling water like their lamp-pumped counterparts. Also, the diodes operate from a low-voltage power supply, which is compatible with a single-phase (110/220 V) line, or with lower-voltage utilities as found in some laser-based machine tools. 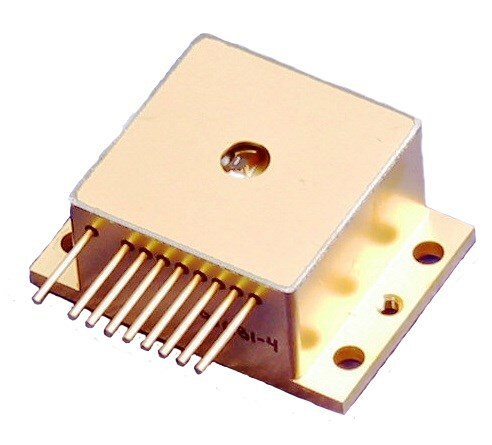 Furthermore, because of the compact size of the semiconductor diodes, the size of the laser head can be greatly reduced. For OEMs and industrial end users, the long lifetime of the diodes is another advantage because it minimizes maintenance downtime. 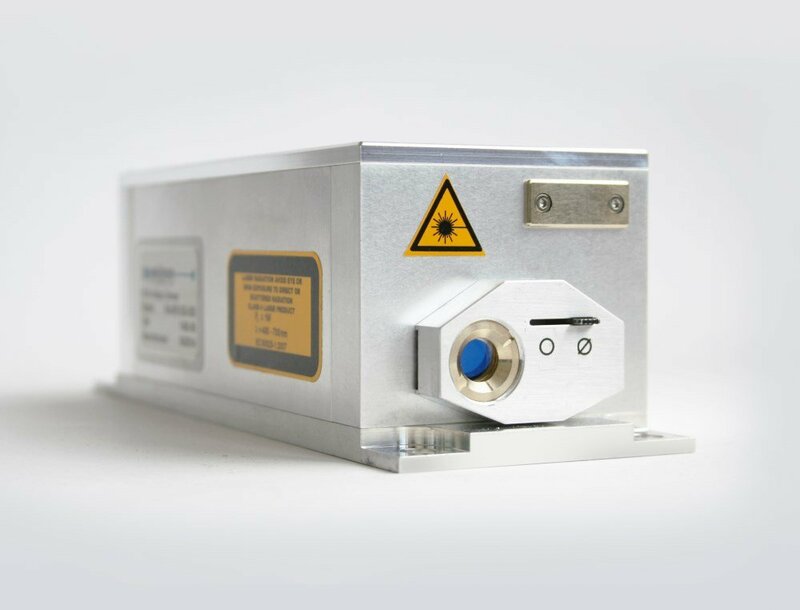 In fact, with continued advances in the reliability of diodes used in DPSS (diode-pumped solid-state) lasers, these lasers can provide many years of uninterrupted operation. There are a few basic methods for introducing diode laser pump light into a laser crystal — two of which are end and side pumping. In general, end-pumped lasers deliver high-quality output beams with state-of-the-art performance and stability at powers up to tens of watts, while side-pumped lasers sacrifice beam quality to offer raw power as high as several kilowatts. In side pumping, laser bars or stacks are arranged cylindrically around the laser crystal (Figure 2). The output of each bar is focused by use of a cylindrical lens and/or a lens array. A large volume of the crystal is thus flooded with pump light, leading to high power and multimode output (M2 >100). Each of these pumped crystals is mounted as a self-contained module. A high-power laser will contain multiple modules in series, each module serving to amplify the output of the previous module. Figure 2. Side pumping enables a large number of pump bars (or stacks) to be arranged around a single laser rod. Typically, side-pumped lasers have been derived from earlier, lamp-pumped designs. Nonetheless, they offer a significant reliability advantage over traditional lamp-pumped lasers and successfully compete in heavy materials processing applications such as welding and metal cutting. The goal of side pumping is to efficiently couple as much power as possible into the laser; in contrast, the aim of end pumping is to couple as much of the diode output as possible into the TEM00 mode volume of the crystal. This not only produces a lower M2 output, but also leads to the most efficient harmonic conversion, providing access to green and UV wavelengths. A more traditional approach for end pumping is fiber coupling, as used in the FCbar (fiber-coupled laser diode bar) — technology first developed by Spectra-Physics — where each diode laser facet is coupled into an individual fiber optic. The fibers are then circularly bundled such that the highly asymmetric diode bar output is converted to a high-brightness spot suitable for efficient end pumping of the laser crystal (Figure 3). Also, since the FCbar module(s) is mounted in the power supply and the fiber is connected to the laser head, it can simply be replaced in the field without any optical realignment. Figure 3. End pumping allows the mode volume of the diode laser to be matched to the TEM00 mode volume of the laser cavity. This architecture can produce a high-quality (M2 <1.2) beam from a compact, rugged, hands-off package, with excellent maintenance lifetimes. Just as important, the flexible diode-pumped technology delivers a wide range of output powers, with a choice of CW, Q-switched, and mode-locked outputs. Enabled by innovation in laser diode technology and increased output power per emitter, a more advanced end-pumping design uses single-emitter-type diodes, which are fiber coupled directly inside the laser head, allowing for easier laser head integration and interchangeability. The life expectancy of today’s diodes is more than 10 years, especially when running below their maximum-rated power (called derating). This design technique enables these models to be virtually free from diode maintenance for many years of continuous operation. Plus, a side benefit from integrating the diodes in the head is the elimination of potential issues that can arise from external fiber coupling, making laser head interchange simple and fast. As a result of improved reliability and lower cost, end-pumped solid-state lasers have found their place in many high-precision industrial applications, dominating areas such as PCB and FlexPCB drilling and cutting, resistor trimming, stereolithography (rapid prototyping), ITO patterning, inspection, graphics, precision marking, and micromachining of a wide range of materials from glass and silicon, to ceramics and metals. In addition, their low cost of ownership and operational simplicity are enabling applications that were uneconomical or impractical for earlier lasers. Since the introduction of diode pumping, a number of laser crystal geometries have been investigated, with varying degrees of commercial success. The most important geometries are cylindrical rods, slabs, and thin disks (Figure 4). Slab- and rod-shaped laser crystals can be designed to be end pumped or side pumped, depending on the power/mode requirements, while disk-shaped crystals can only be end pumped. Typically, rod-shaped crystals dominate the low-power/high-mode quality applications, whereas slabs and disks are commonly used in high-power lasers. Figure 4. In commercial diode-pumped lasers, the laser crystal can be shaped as a rod, thin disk, or slab. The most common Nd-doped material used in lamp-pumped lasers is Nd:YAG, which offers relatively simple-to-grow, large, defect-free crystals and is optically and mechanically robust. Another material, Nd:YVO4 (neodymium:yttrium orthovanadate), offers higher gain than Nd:YAG. However, it was long neglected as a commercial material because the crystals were difficult to grow (i.e., pieces long enough to make laser rods for lamp-pumped systems were not available). With the advent of end-pumped configurations, the use of much smaller laser crystals is making Nd:YVO4 more attractive. In addition, Nd:YVO4 allows shorter-pulse-length operation, which is favorable for many applications. In quantitative terms, Nd:YVO4 has a gain about 5.5 times greater than Nd:YAG. One implication is that this allows very short pulse (<10 ns) Q-switched output with superior pulse-to-pulse stability at high repetition rates (Table 1). Nd:YVO4 is strongly birefringent and naturally polarized, unlike Nd:YAG. The output of Nd:YVO4 lasers is thus naturally polarized, eliminating the need for an intracavity polarizer. With end-pumped lasers, Nd:YVO4 is usually the preferred material for fast pulsed (>10 kHz) and CW operation. In fact, the maturation of this high-gain material proved critical in boosting the power of these lasers to market-enabling levels. On the other hand, Nd:YAG is still commonly used in many models operating at lower repetition rates. The improved gain efficiency and compact designs of the newer Nd:YVO4 and Nd:YAG lasers also result in significantly lower cost for performance. Figure 5 is an example of one of these newer lasers, reducing the cost/W by more than 50 percent for comparable UV and green Q-switched lasers in its class, and even lower cost than equivalent fiber lasers. Figure 5. An example of a disruptive cost-performance laser. A major reason end-pumped lasers with rod-shaped crystals are preferred in many low- to medium-power applications is that they can offer zero-maintenance operation. Operating the pump diodes derated — e.g., well below their maximum rated power — can extend the lifetimes of these devices to well beyond 100,000 hours. This allowed a new approach to laser design, called the sealed resonator, which at the time set new standards in terms of reliability, stability, beam quality, compact packaging, and simplicity of operation. For industrial applications, these advantages translate into low cost of ownership and high process yields. Specifically, the traditional limitations of alignment drift and optical surface contamination are completely eliminated by the use of a sealed cavity. There are several successful ways to do this. At Spectra-Physics, we use a monolithic approach, rigidly mounting all the optics along the cross-member of a closed box I-bar structure (Figure 6). This I-bar arrangement delivers excellent torsional rigidity and stability. Also, even if the cavity temperature changes, the I-bar structure expands uniformly, ensuring that the optics stay perfectly aligned along the same axis. In addition, the optical mounts are all metal, designed for minimal use of epoxies or other outgassing components. Since there is no need to adjust or clean the cavity optics, the head is assembled and tested in a cleanroom and then sealed at the factory, eliminating optical surface contamination as a failure mechanism. Just as important, the use of small, nonadjustable mounts and fiber-coupled diodes allows for an extremely compact laser head. Figure 6. One method of achieving long-term stability of the laser cavity is mounting all the optics on a rigid I-beam platform. The near-infrared (1.06 µm) output is useful for applications such as resistor trimming and surface marking of metals, but many laser applications require visible or ultraviolet wavelengths. Fortunately, the TEM00 output beam produced by end-pumped lasers can be efficiently frequency doubled (to 532 nm), tripled (to 355 nm) and even quadrupled (to 266 nm) using nonlinear crystals such as LBO (lithium triborate) and BBO (barium betaborate). With the current power level of diode-pumped CW lasers, the nonlinear crystals must be placed inside the laser cavity to obtain useful second-harmonic power levels. Spectra-Physics introduced the first multiwatt CW green laser, the Millennia, in 1996. Today, these lasers are well established with output powers exceeding 25 W.
Another route to higher green and UV power is provided by mode locking a CW laser. SBR (saturable Bragg reflector) mirror technology enables simple mode locking that is robust enough for demanding industrial applications. The high peak power of mode-locked lasers allows very efficient extracavity frequency doubling and tripling, providing multiple watts of power at 355 nm. Moreover, the high repetition rate (80 MHz) means that these quasi-CW lasers have replaced bulky ion lasers in many CW ultraviolet applications. With Q-switched pulsed lasers, the peak power is more than sufficient to permit extracavity doubling and tripling. The stable boresighting possible with a sealed monolithic laser head has allowed simple “bolt on” frequency doubling and tripling modules, as well as more cost-effective, integrated harmonic conversion methods. When it comes to expanding applications for Q-switched diode-pumped lasers, there are three areas of laser development of particular note. These involve increasing the pulse repetition rate, enhancing the available green (532 nm) and UV (355 nm) output power, and manipulating laser output pulses in the time domain. Increasing the pulse repetition rate is important in industrial applications, since it leads directly to an increase in process throughput. More output power in green and UV enables processing of more materials with finer precision, thus satisfying the needs for higher-density components such as mass produced microelectronics. And tailoring the output pulses in the time domain means even more control over material interaction efficiencies to enhance processing speed and quality. Pulse repetition rate is often the process-limiting factor in high-throughput applications such as scribing and marking. Here, the high scanning speed of the galvanometers used to sweep the laser beam cannot be fully exploited; the scan speed must be reduced to avoid producing a dotted cut or groove due to the individual laser pulses. Laser manufacturers have responded to this limitation by developing Q-switched lasers capable of much higher repetition rates. Nd:YVO4 is usually the material of choice for higher-repetition-rate lasers, but typical end-pumped designs deliver peak performance at a maximum repetition rate of only 40 to 50 kHz. Pushing these lasers to higher repetition rates traditionally results in lower energy per pulse, lower overall power and a significant increase in pulse-to-pulse noise. However, more recent designs utilizing advanced pumping schemes and harmonic conversions for green and UV laser output, have resulted in Nd:YVO4 lasers with rep rate ranges > 500 kHz, with low pulse-to-pulse noise and still short pulse widths favorable for many applications (Figure 5). As already noted, one advantage of diode-pumped lasers is the laser head’s small size. An example of a very compact laser is shown in Figure 7. The infrared, green, or UV output beam is nearly diffraction limited (TEM00), and allows for tight focusing and high spatial resolution. High reliability, repetition rate, and pulse-to-pulse stability make this type of laser suitable for many demanding applications such as micromachining, marking, and 3D stereolithography. Footprint and volume of the overall laser system can be further reduced by integrating laser head and controller into a single monolithic package. Figure 7. An example of a very compact laser. One of the most significant recent breakthroughs in the area of diode-pumped solid-state lasers is a hybrid fiber/DPSS laser that combines fiber laser technology and DPSS power amplification with efficient harmonic generation. One example delivering high, flexible repetition rates in the green and UV is shown in Figure 8. Moreover, this laser exploits fiber laser flexibility not only to enable variable pulse width, but also to allow the user to control the pulse in the time domain. It produces >60 W of UV (355 nm) output power at 200 and 300 kHz and >300-µJ pulse energy, while operating over a wide range of repetition rates (single-shot to 3.5 MHz) and variable pulse widths (<2 ns to >100 ns). Green versions deliver more than 95 W at 532 nm. The hybrid architecture enables this performance in a nearly diffraction-limited beam and with very low optical noise. Figure 8. A hybrid fiber/DPSS laser. The high power levels, combined with the ability to control and optimize pulse width and sequence, enable high-precision processing of a wide range of materials at very high speeds, including silicon, PCBs and ceramics. Table 2 summarizes, per material, which features are most advantageous for process quality and speed. One of the most challenging applications is the cutting of chemically strengthened glass for smartphones and tablet/PC cover plates, which can be performed at unprecedented speeds higher than 1.5 m/s. The results indicate that process recipe development needs significant flexibility and refinement to suit the process and the user’s objective. With proper parameter optimization, high quality and high throughput can be achieved, extending the capabilities of today’s laser micromachining processes to meet the manufacturing challenges of tomorrow’s consumer electronics products. Diode pumping has revolutionized the design of solid-state lasers and enabled the creation of innovative designs to meet the evolving needs of today’s manufacturing processes. The latest developments using this technology offer a unique combination of advantages, including low power consumption, low heat generation, compact packaging, excellent mode quality, high pulse-to-pulse stability, impressive high reliability, and very high power at a variety of wavelengths over wide operating regimes. And by tailoring the performance of these lasers to the specific needs of new applications, laser manufacturers have ensured a healthy market for these products in a variety of existing and emerging applications.